Los Glaciares National Park is located in a region known as the Austral Andes in Argentina. 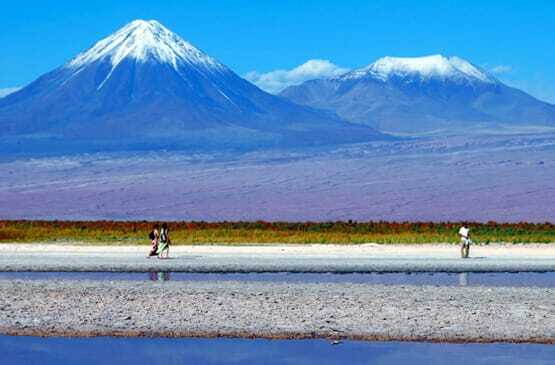 It lies at the southwest edge of the Santa Cruz province, on the border with Chile. Because of its stunning natural beauty, Los Glaciares National Park today is part of the natural wonders of our world, and was declared a UNESCO "World Heritage Site" in 1981. The name of Los Glaciares National Park means "The Glaciers", due to the series of glaciers that are born on the Ice Caps of the Southern Andes. This is the largest continental ice extension in the world, after Antarctica. Also known as Patagonic Continental Ice, in the region we find 47 big glaciers, 13 of which flow to the Atlantic. There are also more than 200 smaller glaciers that are not connected to the Ice Caps. Los Glaciares, of which 30% is covered by ice, can be divided in two parts, each corresponding with one of the two elongated big lakes partially contained by the park. Lake Argentino, 1,466 km2 (566 sq mi) and the largest in Argentina, is in the south, while Lake Viedma, 1,100 km2 (420 sq mi), is in the north. Both lakes feed the Santa Cruz River that flows down to Puerto Santa Cruz on the Atlantic. Between the two halves is a non-touristic zone without lakes called Zona Centro. 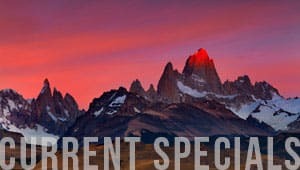 The northern half consists of part of Viedma Lake, the Viedma Glacier and a few minor glaciers, and a number of mountains very popular among fans of climbing and trekking, including Mount Fitz Roy and Cerro Torre. The southern part has, as well as a number of smaller ones, the major glaciers, which flow into Lake Argentino: Perito Moreno Glacier, Upsala Glacier, and Spegazzini Glacier. Typical excursion boats travel between icebergs to visit Bahía Onelli, and the otherwise inaccessible Spegazzini and Upsala. The Perito Moreno is reachable by land. The park has a cool and moist temperate climate. Mean temperatures range from 0.6 °C (33.1 °F) in winter to 13.4 °C (56.1 °F) in summer although at higher altitudes, the mean annual temperature can be around −3 °C (26.6 °F). The park receives an average annual rainfall of 500 mm (20 in) in the west and 900 mm (35 in) in the east, which is evenly distributed throughout the year. Snowfall is common during the colder months. The mountains hold most of the humidity from the Pacific Ocean, letting through only the ice coldness (annual average of 7.5 °C (45.5 °F)) and creating the arid Patagonian steppe on the Argentine side of the range. This area is a habitat for ñandúes, guanaco, cougar, and gray fox. Some of these have suffered from the invasion of the cattle industry and are endangered. The guanaco, while not endangered, has had a dramatic decline in historic population due to large scale grazing of livestock throughout much of Patagonia. There are over 1000 species of birds in the area (condors, eagles, and others), but only 100 have been registered. Between the ice and the Patagonian steppe there is a fertile area of Magellanic subpolar forests composed mainly of lengas and guindos, but also ñires. Within these more hospitable areas also live huemul deer and torrent duck. The property has an impressively long formal conservation history going back to 1937. Los Glaciares National Park is a state-owned unit of the National System of Protected Areas in Argentina (Law No. 22.351 dealing with the National Park Administration), and it was created in 1937 when Law No. 13.895 was enacted, while National Law No. 19.292 of 1971 established the current limits, including the division of the area into a National Park and a National Reserve. Most of the territory of the Magallanes Peninsula, in which the Perito Moreno Glacier is located, is a Provincial Nature Reserve serving as a buffer zone of the property. The property has specialized administrative and technical staff and park rangers. There is also a fire brigade and support park rangers. While the Superintendence and main administrative office operates in the small town of El Calafate, there are additional units distributed across the property. The Regional Technical Office Patagonia provides professional, scientific and technical assistance. Management is guided by a preliminary management plan (approved in 1997 by Resolution N° 162). It will require continuous review and updating in response to emerging demands. Since 2002, Los Glaciares National Park established a local Advisory Council bringing together national, provincial and municipal entities, non-governmental organizations, the Chamber of Commerce, the Association of Tourist Guides and a Scout Group among others stakeholders. This Council has an advisory role to the management of Los Glaciares National Park. While tourism is localized and mountaineers and climbers can only access many parts of the property, there are seasonally crowded areas in the property requiring carful public use planning. The Public Use program has been updated to fulfill the Restructuring Plan for the Moreno Glacier Sector, due to the increase in tourism and to the fact that it has the most appealing values for visitors. This restructuring included road improvements, planning of visits through a new walkway system, services for visitors, such as restaurants and toilets, in order to improve the property protection and the quality of the visit. Historically, overgrazing is among the biggest human impacts, in some areas to this day. The management addresses this through agreements for the conversion of cattle raising farms to touristic uses. Feral cattle remain in two uninhabited areas, Avellaneda Peninsula and Onelli Bay, and will eventually have to be removed. The latter is part of a program to control alien invasive species. Other noteworthy introduced species include the European Hare and trout species in the lakes and streams. The continuation and consolidation of the Research and Monitoring Program are required, which include the project to conserve the Huemul Deer, one of the most remarkable species of the park. The latter is a longstanding project with a history of more than two decades and is conducted jointly with neighboring Chile.